As the days breeze by, the New Year gets closer and closer. With the holidays approaching, the season of giving is here. Around the holidays, the Valley Heights District always does something to impact the community in a positive way, one of them is the annual Block out Hunger Day. 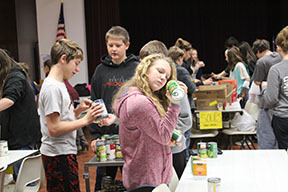 The Block out Hunger Day was held on Tuesday, the 21st of November and was put together by Valley Heights StuCo. “The Block Out Hunger Day has always been a good thing that sends us off before Thanksgiving Break”, said Tyler Wagner,so. The concept of the Block Out Hunger Day is to stack non-perishable food items donated by students and teachers in front of teachers’ doors all the way across and around 4 feet high. If done correctly the teacher whose door is completely covered will not have class that day. All doors were blocked, and there were over 1000 food items donated! All of the food was delivered to the Blue Rapids local food pantry. 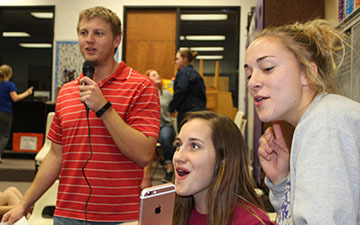 If students were caught up with their work, their days consisted of games and activities held throughout the school. “The games were fun, I enjoyed our day a lot”, said Sr. Donald Thompson. Students could play games in the gym, there was also an I-pad room, board game room, karaoke room, and many more to choose from. “We were really proud with the number of food items donated, and glad everyone enjoyed their reward” said Sr. StuCo member, Skylar Sanders.